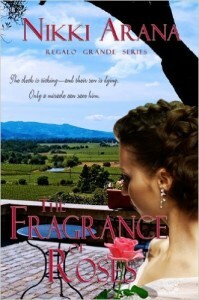 The Fragrance Of Roses by Nikki Arana is the third and final book in the Regalo Grande series, and what a fabulous climax it is. I devoured this book with my heart racing, my pulse rising and a box of tissues! Antonio and Angelica now have two children… ten year old Manuel with Downs Syndrome and eight year old Anica. The reader hears that five years previously Manuel fought and won a battle against leukaemia, but now the deadly disease rears its head again. The Fragrance Of Roses is a novel about faith, families and fear. Antonio relies on his love for the Father who works all things together for good for those who love Him. For Angelica, her faith is tested, as fear threatens to overwhelm her. She must keep her eyes fixed on the Father and not on her fear. The theme of family continues throughout the novel. Family is immediate relatives, it is extended, and it is God’s family. Family is important. We all need to feel we belong somewhere. God’s family is of utmost importance. It is our duty to introduce God to people who do not know Him. The novel is about sacrifice. The greatest sacrifice ever made was when Jesus lay down His life for us. Journey through the novel to see who sacrifices what. Faith lives on even after we have gone. The faith of Poppy (book one) and Maclovia (book two) still have the power to affect lives, even after several years of leaving their earthly bodies. The novel explores the power of prayer. God always answers prayers, but not always in the way we expect. In all things, God’s will must be done. Nikki Arana raises several important issues within the novel that need to be addressed in our lives – they include being blood donors, and the lack of God in our schools. The novel certainly gives food for thought. I have adored all three Regalo Grande novels and can highly recommend the series. All three books are beautifully written, and I got caught up in the lives of Antonio, Angelica and their families. Now that the books have ended, I feel like I have said goodbye to dear friends. Give yourself a treat and invest in Nikki Arana’s Regalo Grande series, you will be glad you did.